Clank! : The Mummy’s Curse is the newest expansion for Clank! : A Deck-Building Adventure. The original game and its first expansion, Clank! : Sunken Treasures, were designed by Paul Dennen, but this expansion was designed by Andy Clautice. All of the Clank games are published by Renegade Game Studios. Clank! : The Mummy’s Curse is the second expansion for Clank. There is also Clank! In! Space!, but as that is a stand-alone game, and is not compatible with the Clank base game or these expansions, I won’t be discussing it. I will go a bit of detail on Clank! : A Deck-Building Adventure for anyone unfamiliar with series, so feel free to skip below if you are familiar. When Clank came out, it was another deck-building game in a very crowded field of deck-building games. Except it turns out it wasn’t just another forgettable entry, as the market for using deck building as one element in a larger multi-faceted game experience that isn’t solely focused on that singular mechanism was not nearly as crowded. Hence, games like Clank -- which mixes deck building with dungeon crawling -- and Tyrants of the Underdark -- which mixes deck building and area control -- got a lot of positive buzz for breathing some fresh life into the genre, and showing some new and exciting possibilities for a mechanism that was feeling a bit tired. Clank uses a number of deck-building staples. Each player starts with an identical deck of cards, some which gave basic actions such as move and attack, and some that penalize players by making them add clank cubes onto the game board. There is also a row of six random cards that can be purchased by players on their turn to add to their decks. This is a mechanism in a lot of deck-building games, including Ascension, Legendary, and the Cerberus engine games like DC Deck-Building, but is not found in the prototypical example of the genre, Dominion, which has a more static purchasing system. In addition to these deck-building standards, Clank adds the element of spatial movement around a game board -- grabbing treasures at different locations, buying items at a market that can only be accessed at that space on the map, and the end game being triggered by a player traveling out of the dungeon on the map. Tying the actions of the card play to the physical spaces on the board adds an extra dimension to how the game plays, and allows players to see the progress of their opponents -- not just having to remember how many victory point cards were buried in each of their decks. So what exactly does this expansion add to Clank? Well, for starters, it adds a mummy meeple that travels around four distinct areas on the new double-sided game board, as well as curse tokens that both the mummy and the board deal out. It also adds a four-sided die that controls the mummy’s movement, some new cards, a few new major and minor secret tokens, and a green dragon meeple that serves no function other than to replace the original black dragon meeple -- but it looks slightly different, so there’s that. One side of the new game board has a Sphinx above the depths, and looks similar in layout to the previous game boards (although there is the addition of the mummy, and spaces that require taking curses to move through). The other side of the game board, in a clever thematic touch, rotates the board forty-five degrees and features a pyramid above the depths and a triangular shaped catacombs below. This side, being so aesthetically different, will likely draw more immediate interest, especially from players new to the expansion. The mummy starts in one of the three underground zones, and only moves when attacked or when card text dictates. When the mummy does move, it is resolved by the four-sided die, which can place him in one of the three underground zones, or the above ground zone. When the mummy moves into a zone currently inhabited by a player, that player must take a curse token. While they are in the same zone, they can choose to fight the mummy, and are rewarded with either taking four gold and one curse token, or by being allowed to return half of their curses. While the curses, which are worth -2 victory points each, do add another element of push-your-luck to a game that already features that with the clank bag and dragon, it feels different, as this time players are gambling with their victory points and not with their lives. The gamble is especially compelling as certain spaces on the board require taking up to three curses to move into, and because players can lose halve their total curses, rounded up, by fighting the mummy a single time. Both expansions get two things right. First is the need for fresh new maps, as Clank games can start to feel similar if played repeatedly on the same map with the same group. Second is the need for more than one market space, made possible by splitting the market board off the main board, and allowing access to the market board from multiple spaces on the main board. This allows different paths to be taken without sacrificing access to keys and bags, as well as SCUBA gear in the case of Sunken Treasures. Both expansions also added new mechanisms. The Mummy’s Curse added the interactions with the mummy, and the resulting curses, and Sunken Treasure added the semi-flooded board, with the added noise from splashing and the SCUBA gear available in the market. Here is where I feel that The Mummy’s Curse differentiates itself, as I find Sunken Treasures more interesting in theory than when I am playing the game -- due to the difficulty in getting enough gold for SCUBA gear as well as a bag and a key -- while I find the implementation of the Mummy’s Curse mechanisms smoother and more rewarding to play, as they don’t require grinding for gold to enjoy the new aspects of the game, and actually make gold easier to acquire through fighting the mummy. This expansion is for players that are looking for more variety and content, specifically content that has a neat little twist on the existing game, along with a fresh new theme. It does not add anything major -- no fifth player, no cooperative mode, no added dexterity mechanism, etc. It also, to its benefit, doesn’t add much in the way of rules overhead or complexity, which means you can play it with new players without first feeling compelled to teach them the base game. Pros: More cards for Clank that are well integrated with the Mummy’s Curse theme! Two new boards to traverse, including one that plays diagonally! A persistent mummy that can be attacked for large rewards, and includes a cool new meeple! A market board with multiple places to access from the main board! Cons: It doesn’t shake up the game enough to change anyone’s mind that doesn’t already enjoy Clank. The mummy’s movement being randomly determined by a dice roll can feel be punishing, both when you are trying to avoid it and when you are trying to fight it to get rid of curses. The curse mechanism is another push-your-luck aspect, which can be too much for some players. A storage note for anyone that, like me, does not like to keep expansion boxes: The Clank base game box will hold both the Sunken Treasures and The Mummy’s Curse expansions along with the base game with no difficulties. Ultimately, this expansion will appeal to people that like the Clank! franchise and are looking for more of it -- more boards, more cards, more enemies, and more new little tweaks. It is an evolutionary expansion, not a revolutionary one. It doesn’t change the game fundamentally enough to sway someone that does not like the base experience, although I am sure many will enjoy the Egyptian flavor of this particular expansion. Full disclosure: I received a review copy of the Clank! 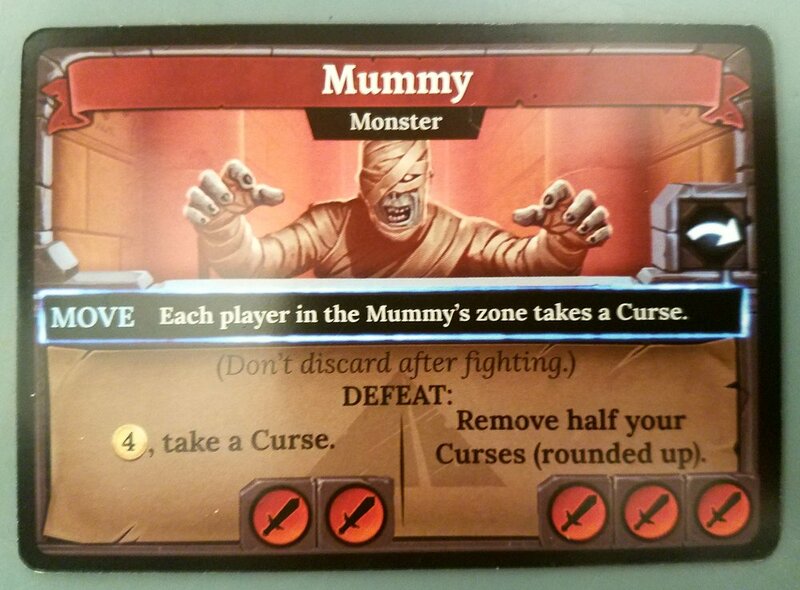 : The Mummy's Curse expansion from Renegade Game Studios. Both the base game and the Clank! : Sunken Treasures expansion are from my own collection and were not provided as review copies.